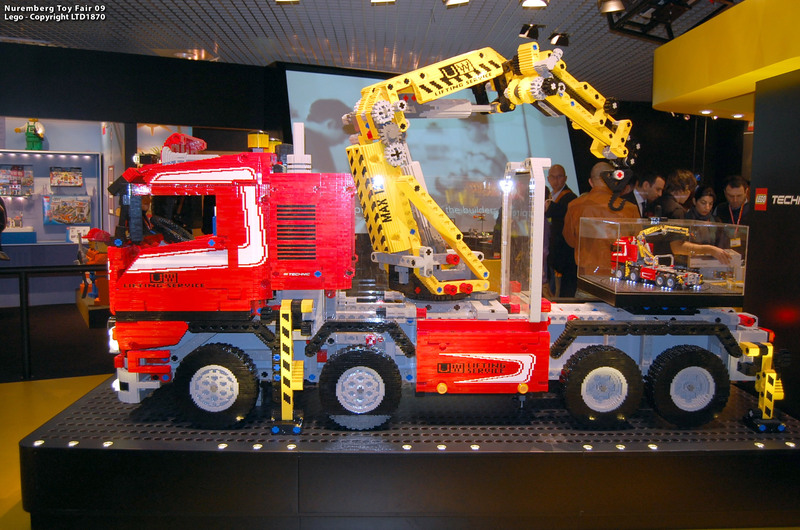 A few more images from the new TECHNIC 'Crane Truck' (8258), were taken at Nuremberg Toy Fair 09 and uploaded into this BS folder. Quite some conclusions may be taken already from them, or at least some guessing for a few a cases. So please, realize on the overlayed green circles and lines, in the previous images copies below, and respective comments also below. Click on the pictures, in order to get their full sized version and better visualization. Which new panels are used where, is now much clearer. Two LAs to control some crane sections. As realized on a previous post there are included just a few PF elements: The battery box, an M-motor and one Switch. Two section articulations driven by the LAs. The two other functions are not clear from this pictures, but imagine they could be: the crane turntable rotation, and stabilizers moving up and down. PF switch on the truck right side compartment, seems to switch direction of all movements controlled by the gearbox above mentioned. Both winch and boom extension/retraction seem to be controlled manually. Some suspect, a new type of rack may be present into this set (either into stabilizers mechanism and boom extender mechanism too). Some have also noticed there seems to be, two new types of studless TECHNIC frames, below and after the crane turntable, as well as on the rear axis (vertically mounted). These seem to bring pin-holes in perpendicular directions, to larger beam pieces, which will means increased connections versatility for the system and stiffer structures. From what can be seen, it seems there is an 'H' like formfactor version (probably 11x5) and another smaller rectangular one. Also a new 'T-like' beam or connector piece, again increasing the options to easily build in orthogonal directions. Some wonder what is a '16T Clutch Gear' doing in there. But guess it allows the gearbox to selectively transmit drive to both LAs under the limited space above the turntable. Despite imagining a few possible reasons, also wonder what does another '16T Clutch Gear' here, attached to an 'axle 8 with stop' instead of a normal 16T gear with a standard axle. And what is that, here? One LA bracket!? Most likely yes, but quite unexpected. TLG also didn't want to left the occasion goes by, without displaying a large scale version of this same model. Overall, my impression from this set is increasing. Every year's new parts are giving TECHNIC sets, more and more realism, while offering new building possibilities, functions and compactness. Now the profit is back, it seems TLG also realized that always producing new parts, while keeping permanent control to the number of active elements, drives fans interest and potentially generates new sales. Thanks Ryan, Martijn and Jo, for letting me know about these new photos. Awesome post Conchas, thanks for the pics. On the new technic frames, checkout no_onion's flickr pics of the new Bionicle sets. Gotta look at his high res pics, at least 3 of the sets have it, and I'm guessing its 5 wide x 11 long, not 6 wide. (I was going to email you guys but figured its old news in the euro technic forums (we amaricans are way behind on that curve)). Very glad to see multiple new studless variations of Technic beams and frames especially with perpendicular pin holes. Anyway I want lots of them, fast! And reference to your note # 2 on the pic, totally agree the black piece is a new type of technic beam (you can see the blue axle pin in the yellow beam). Love the functionality of what these new pieces can bring. Lots of other new awesome stuff that I wish we had more details...anyone have more pics of the Nuremberg Toy Fair?... 8265 was in the background of a pic in that BS folder you linked to. Is the 8063 going to be a hoax? you are right about the vertically placed frame on the rear axle. It looks like another frame. From the picture, it seems to me it could be also the same used in the middle position of the top ones, but can't be sure yet. Have meanwhile updated the post and edited the image again. Thanks! You are also right about the blue pin on the presumable new rack piece. To me it seems a kind of rack piece embedded into a beam form factor, which may confer more stiffness and robustness in some setups. Also it opens new usages and ways of building with rack parts. Still don't know whether 8063 is an hoax or not. At least it is already listed at Brickset. So it looks real for several of us. 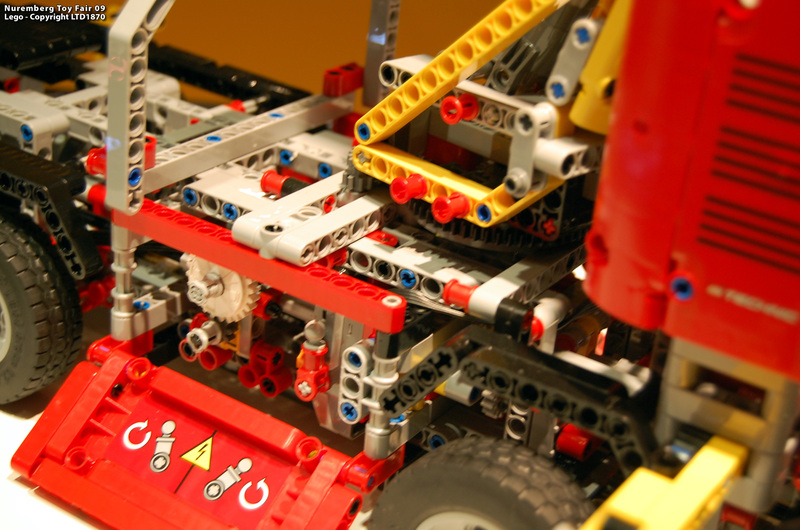 thanks for posting about the TECHNIC frame appearance on the new Bionicle sets. From there it definitely has an 11x5 form factor. It appears to have the same "play factor" as the 8868 Air Tech Claw Rig, but mechanical instead of pneumatic, and with a hook instead of a claw. As for the 16T clutches, I assume it's simply because movement needs to be transmitted without affecting their axles, either because they're used for some other function or are fixed for structural reasons. A bit like in the 8824 Hovercraft (used to transmit power to the propeller through the steering axle) and the 8284 Tractor/Buggy (also used to transmit power through the steering axle). As for what appears to be the extra LA bracket, it indeed appears to be fixing neither the "shoulder" nor the "elbow" LA's. Quite strange indeed... it would be a bit too optimistic to assume it would unlikely be the mythical "Power Functions S Motor", driving the arm telescoping and/or the winch. Regarding the usage of the clutch gear inside the turntable (in fact it is little above) is exactly because it is needed to drive movement through the gear axle int the first LA, while the gear itself drives other in direction of the 2nd LA. The space is limited and this was a possible solution. For the top clutch gear, like you wrote I think it is exactly because the axle can't turn, as it goes through the end of a 'Technic, Liftarm 1 x 11.5 Double Bent Thick'. Other possibility could have been to decrease friction, even further than using an axle/pin without friction. @ Ryan: I really hope it's a new part! Since you built the mechanism, you surely saw there's a gigantic lag between rotating the bottom gear and the top gear following it and vice-versa, due to the way the driving rings mesh with the clutches. For this application it's not very relevant, but for others, like driving the tracks on Jennifer Clark's JCB JS220, it can have a big impact. With what you guys are discussing, now I really want to see detailed pics of the 8265 Wheel Loader - maybe the new LA brackets are used there to control the synchronized action of the 2 lower LA's on the 8265 (or an additional new pc!). haha that frame has holes in more than one dimension what are lego thinking! Ok its about time they got around to realising its all a bit one dimensional.. Yes, its about time to innovate! I have been wondering, when TECHNIC gives the next step, like it was with the introduction of beams and panels, along the late 90's, early 00's. Also the new panels introduced first last year and continuing this year, look like a revamp while also open a lot new possibilities. Only downside is that it is quite easy to fill up a model using lots of those new beams. It makes the model more massive but it also somewhat too easy. Kinda like the big parts in some city sets. There seem to be at least 8 to 10 in 8258. It reduces the part count drastically. I like it. I like it vary much in fact. It looks as though there is some complexity , would be nice if both rear axles are driven. The only bad point really is the colour scheme. It's horrible and i think it's even enough to put people off. Black and yellow would be cool. White and blue would be awesome or even blue, black and silver. Lime green would be crap but anything is better than red and yellow. looks like a pizza!!!!!!!! And still no pneumatics. I understand that LA's help to add some complexity in this particular model and, for other reasons, are a good choice in this particular model. 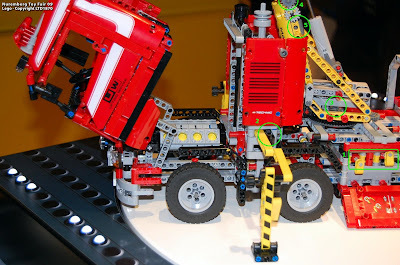 But this model is the exception and in the case of every other model that uses LA's (especially the new wheel loader) I would have GREATLY prefered longer pneumatics. The 8258 Outriggers. How they work?